Thursday's Quilt Market Report (are you tired of me yet?) - Stop staring and start sewing! Alrighty then! The winner of yesterday's frosty charm pack is Jan Richards (5:00 pm). Everybody clap for Jan! Seriously, stop whining about not winning and clap for Jan (besides, the weeks not over and I got some more stuff to hand out)! Here is a picture of Paula and myself at the fabric 2.0 party. I stole this from her blog but since Joey was the photographer I don't feel too guilty. Check out that sunset. 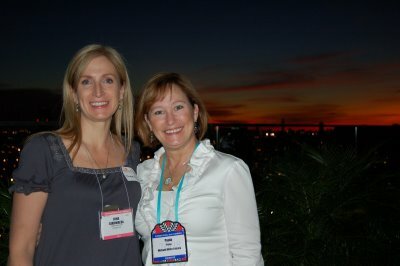 And be sure to check out her blog because she's got a great market report and lots of pictures. 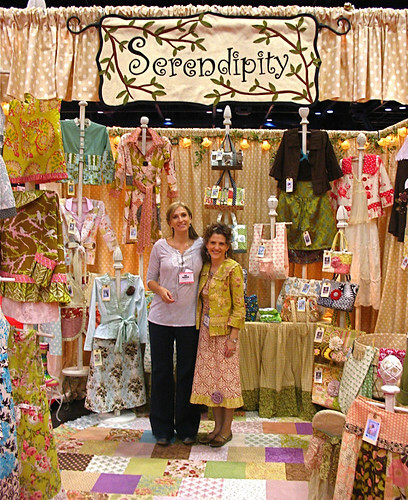 One of my absolute favorite quilt market people is Kay Whitt, the owner of Serendipity Studio. I started stalking Kay in Portland because she has the most amazing booth. She creates patterns for things you can wear which just thrills me. I wore my favorite skirt on Saturday just to show her my devotion to her patterns (yes, I admit it, I am a major kiss-up and I'm okay with it). And it turns out our husbands work in related fields so they could talk shop while Kay and I did the same. 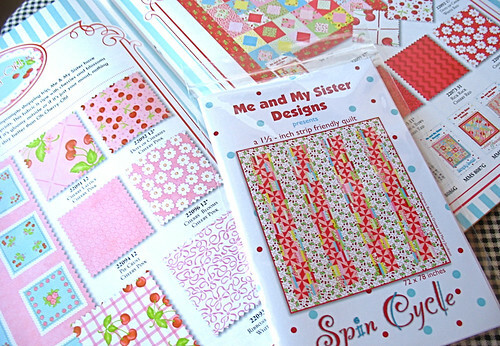 I bought a bunch of her new designs and they'll be in my store later tonight. Here are the two of us. In Kay's defense, I am wearing my tall clogs (although she is a petite gal)! 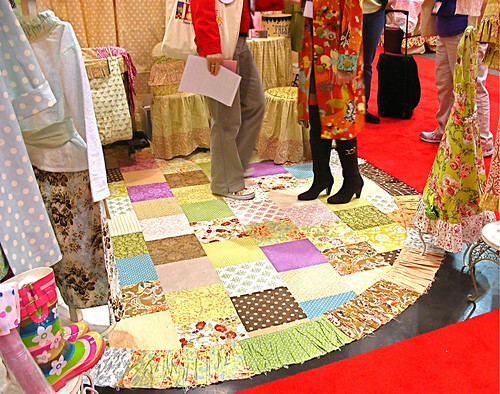 Here is Kay's beautiful floor quilt (and her totally cool boots). 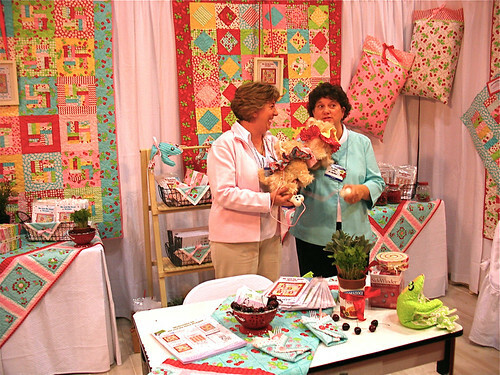 And I was lurking again when I saw Kay was chatting with Nancy Zieman (the Queen of Sewing)!!!! Oh my gosh!! 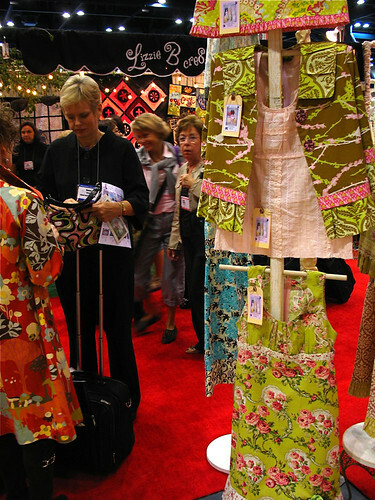 So I got some pictures of that because really, how often do you get that close to Nancy Zieman?! Here's another angle (I pretended to take pictures of the dresses). They were chatting about the book Kay is writing. Here's some eye candy for you. All vintage. This was a great booth! 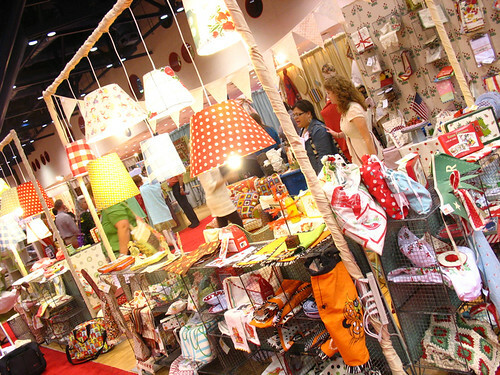 Moda had an amazing array of booths but I think the Moda Home booth is my favorite. 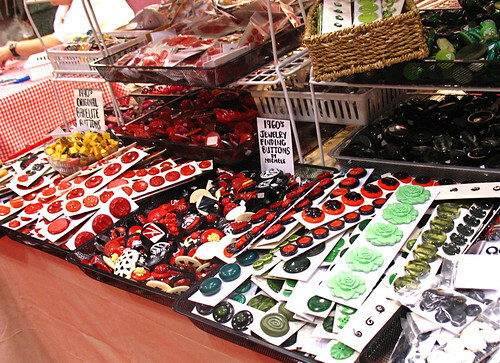 They have great tablecloths, bedding, kitchen ware, you name it. I got to spend some time chatting with Angela about Moda's online fabric matcher which is really a great service (and lots of fun). We also had fun chatting with Mary and Barbara of Me and My Sister and it turns out they both live just a few miles from us! They gave us lessons on jellyrolls, layer cakes, turnovers, and sweet rolls (all quilting terms it turns out). By the time we left their booth we were both very hungry for some reason. 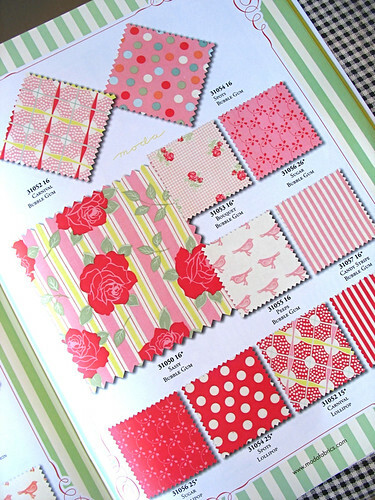 And do you remember last spring when Moda came out with that gorgeous line Swell? It flew so fast I didn't have time to get it for my store. Well, I learned my lesson and ordered the follow-up line called Sweet (and it is!). Here's a peek. You're going to love it! I hope they don't send the Moda Police after me for showing you this picture. 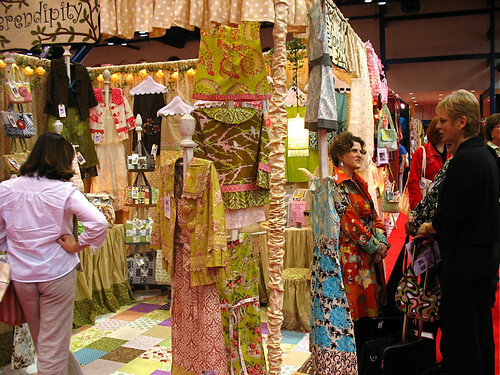 My final Quilt Market post will be on Saturday and I'm putting together a terrific giveaway (I mean amazing, like knock your socks off type of stuff). So don't go too far!